Despite all of that, I just can’t get on board with what’s going on here. 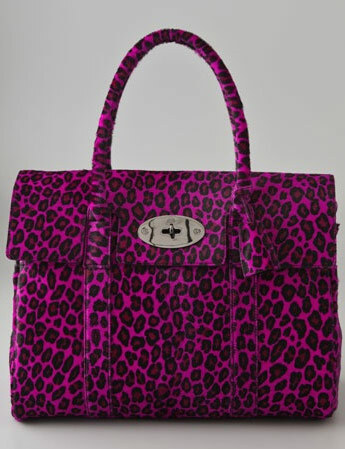 The idea of magenta cheetah print is not necessarily one to which I’m opposed (in fact, I rather like it), but the execution on this bag is just not what I would expect from the fine folks at Mulberry. The issue that I have with this bag is primarily one of proportion. The Bayswater is a fairly large bag, which is usually to its credit, but the scale of the pattern is wrong for the bag. 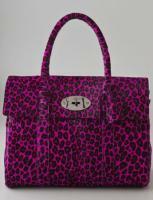 The cheetah print is tiny, and it only looks smaller when shown in such large quantity on a bag with fairly clean lines. Just like plus-sized people are always advised to stay away from tiny patterns (which is a good rule for anyone larger than a size 2, from personal experience), this diminutive print only serves to remind us of just how much of it we’re looking at. If the scale had been larger and the overall effect a little bit more graphic, this bag could have been an awesome neo-80s accessory to pair with otherwise boring outfits. As it is, the design just doesn’t work. Oh, and the material – fuzzy bags freak me out, I’ll leave it at that. Buy through ShopBop for $2650.